Subject: Representation of Defence Civilian Employees' Federations regarding misinterpretation of Revised Pay Rules 2016 leading to incorrect pay fixation of employees — reg. The Defence Civilian Employees' Federations have reported that the Accounting Authorities in the Defence Estts. 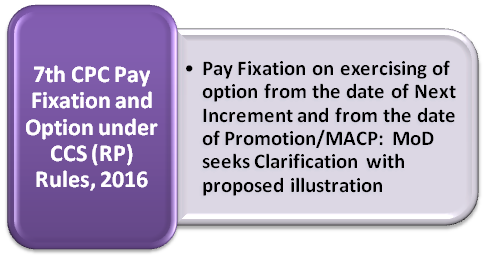 are misinterpreting the provisions of CCS(RP) Rules, 2016 leading to anomalous pay fixation of the defence employees. The Federations have demanded that clarification may be issued to the Defence Estts. to enable them to issue correct pay fixation orders of the employees, on the basis of the options exercised by them. 2. Taking into account these reports, MoD has sent a proposal to MoD(Finance) to seek clarification about the manner of fixation of pay through illustrations prepared by this office. The said proposal for seeking clarification been sent to MoD(Finance) on 5.12.2016. A copy of this proposal is enclosed for information. In view of the complaints of incorrect pay fixation in defence establishment, it is requested that the clarification on this subject from Ministry of Finance/ MoD(Finance) may please be awaited so that the pay fixation of the employees could be issued on the basis of right position. This position may please be communicated to various Accounting Authorities under the control of CGDA to avoid any inconsistencies in the matter of pay fixation. 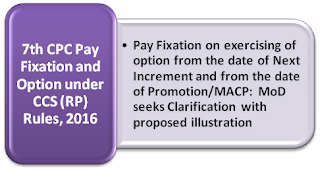 i) Arrears of pay admissible only for the period 1.7.2016 onwards. ii) For the period from 01.01.2016 to 30.06.2016, pay will be on the old pay structure. No arrears admissible for this period. i) Arrears of pay admissible for the period from 01.01.2016 to 31.07.2016.
iii) Arrears of pay admissible for the period from 15.03.2016 to 31.07.2016. I would earnestly request GOI MOD to give effect of their order dated 30th September (De-linking Q.S of 33 years) while giving effect on the OROP Fixation of basic Pension which is w.e.f.1.7.2014 is based on pro-rata reduction in pension and the order of 30.09.2016 is without any pro-rata reduction w.e.f.01.01.2006. Only after giving effect of the latest order as above the GOI MOD may be pleased to fix the 7th CPC Basic Pension. I request GOI MOD to please review the above anomaly and issue necessary orders since the OROP Order is based on Pro-rata reduction of Pension. What about option I regarding pensioners.